One of my favourite truths as an ex-teacher is that intelligence is more about the questions you ask than the answers you give. I have had several experiences lately that have led to lots of questions – mainly towards the end of this, so if you have any answers or observations please share them. That is why I highlighted the wonderful bee book recently in a post headed more on bee sight – it contains magnified pictures of the honey bee. When you show it to those of any age from about 5 – 95 years of age the questions start pouring in a torrent from their mouths – and they learn at a similarly fast pace. If you fed the same information in a lesson the amount of retained learning would probably be a fraction. Pictures are also multilingual – or at least they only need a comparatively small vocabulary. I also wrote recently about my trip to the FloriadeBee Pavilion – or should I say bijenpaviljoen as I am starting to be curious about the Dutch language and rather like some of their word structures. 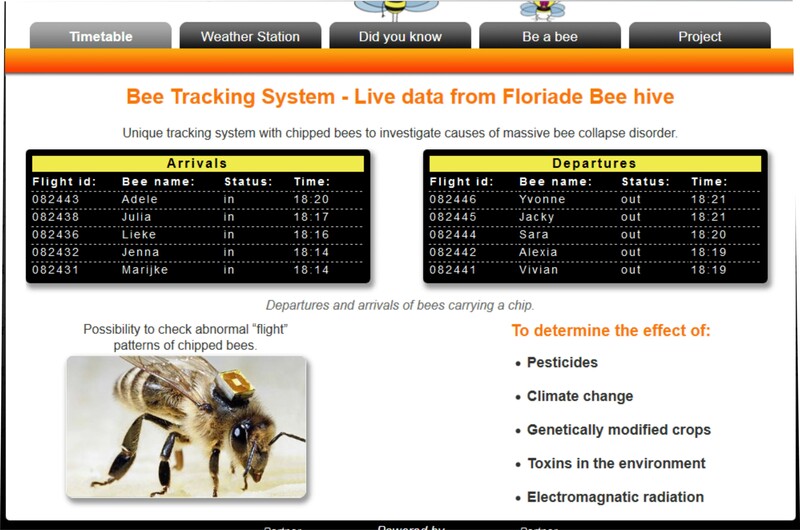 One of the pages supportingthe project shows the 5 most recent tagged bees to enter or leave. A few stats can be helpful but I became curious and set up a web query from Excel trying to capture a more extensive record of bee movements. Unfortunately, sometimes this spreadsheet needs to have the new data added every 5 minutes so there are lots of gaps in my sheet because I ought to be doing so many other things. At the moment I am keeping all the raw data but I may then analyse the data discarding the trips for which I have missed either the start or end of the journey. Luckily the journeys are numbered so at any stage I can reorder chronologically. However, I can also put data in alphabetical order which will be much easier than trying to visually spot the next activity of any one bee. So – what have I noticed and what questions arise in my mind? It almost looked as though the two bees were twinned or they had the same shift pattern. Are all ‘trips’ of a similar duration? Is it just that these two bees were collecting from the same source so journey time was similar? Were they actually travelling together? What about their times inside the hive – did that represent the time they needed to pass on their load or did they have other duties – or a sleep or a meal? I think I read that bees either collect pollen or nectar not both at the same time. The bijenpaviljoen ‘Be a Bee’ experience seems to confirm this. Does a pollen collecting trip differ in duration from a nectar collection trip? Or does it depend more on the journey to the source than the purpose of the trip? And – is there an easier way to collect all the bee data over, say a day or a week? This entry was posted in Analysis of live bee data from tagged bees, Bee curious, Bee life and tagged analyse live data, answers, beepaviljoen, filter, Floriade 2012, honey stomach, inside hive, intelligence s, live data, nectar, pollen, pollen sac, questions, sort, tagged bees, trips to collect nectar, trips to collect pollen, web query. Bookmark the permalink. 6 Responses to It isn’t the knowledge you have it’s the questions you ask …. Very interesting. Have you read The Buzz about Bees by Jurgen Tautz? I’m reading it at the moment and it mentions this as something that happens. The book says (p111) “Foragers that collect from the same site, and that are marked with a small paint spot, can be observed to stay close to one another in the hive, and even spend the night in the same cluster”. Your research backs this up! The Buzz about Bees also touches on this. Collecting pollen & nectar together is rare but does sometimes happen. Two studies of bee collection habits found that about 58% of bees collect nectar only, 25% pollen only and 17% both nectar and pollen. Bees are willing to travel further for pollen than nectar, as pollen is a lighter load, although nectar gives them a higher energy return relative to effort (8:1 gain pollen, 10:1 gain nectar if a 40% sugar nectar). How interesting – how exciting even. I am going to look for more ‘flying buddies’ in the analysis. I am also going to see what patterns I can discern in the flight times and see whether I can identify whether bees might be going for pollen or nectar. Not worth me downloading more stats to-day – jubilee street part starting in a couple of hours and I don’t think teh hostess should press refresh on her computer every 5 minutes – do you. but perhaps there is time to order that book you mention. Hard back I think – but perhaps if it is good I might have a kindle copy, too. I have the hard back version, the photos are spectacular and I’ve not come across another book with so many insights into bee behaviour. Good luck with your research and hope the party went well! I’ve got the hard back now. I am trying to read it in small chunks as there is so much in it. I don’t want to miss a point because at first it was eclipsed by another in the same page /paragraph. I failed to approve your comment when it was first posted – but then it was our street party day.